Seated Dime Coins The basic obverse design of the Seated Liberty dime coin features the figure of the goddess Liberty clad in a flowing dress and seated upon a rock. In her left hand, she holds a Liberty pole surmounted by a Phrygian cap. Liberty’s right hand rested on the top corner of a striped shield with a diagonal banner inscribed with the word “LIBERTY.” The shield represented preparedness in the defense of freedom. 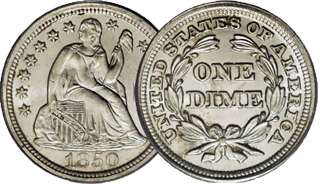 The date of the coin appeared on the bottom below Liberty. Reverse The reverse consistently featured a wreath around the words “ONE DIME”. Before 1860, this wreath consisted of laurel leaves, but beginning that year, the wreath was enlarged and was filled not only with leaves, but also traditional American agricultural products, such as corn and wheat.